Your employees may work at their desks, remotely, between conference rooms, or some mix of all of them – and all have different needs when it comes to the kinds of PCs, laptops, and mobile devices they require to get work done. The responsibility to provide the most fitting devices to the entire workforce, while balancing the organization’s security and management requirements, falls squarely on the shoulders of IT. Download this resource to ease the decision making process. 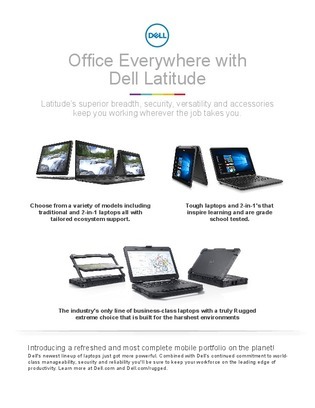 Inside, compare a suite of desktop devices designed to meet the needs of all workers, from traditional PCs to laptops, rugged devices and much more.